Attending school today is very expensive. Paying tuition requires loans. Some students also take out loans for housing or use credit cards to pay for expenses like books. This can leave a person with massive bills that are largely due just after graduation. Ignoring debt from school can ruin a credit report. Successfully dealing with the debt requires planning and action. 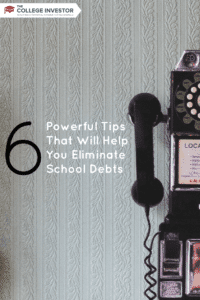 There are six tips that will help anyone to manage and eliminate school debts. The first step when managing school debts is to reduce expenses as much as possible. This is often easier to do while still attending a university. Reducing expenses should involve stopping unnecessary services in a home or apartment. It might mean taking public transportation instead of driving a car. Spending on entertainment, restaurants, and unnecessary items should be cut back dramatically. Reducing daily and monthly expenses will make it easier to repay debts without falling behind. Some people leave school with multiple loans and credit card debts. The best policy is to start paying down the debts with highest interest first. This is because higher interest rates will cost more money the longer the debt goes unpaid. Paying down high-interest debt first will save money over time. It is frequently beneficial to use a low-interest credit card or debt consolidation loan in order to pay off the high-interest bills. This can reduce the amount of money paid every month. One option is to consolidate all existing school debt. Debt consolidation uses a single large loan to immediately repay all of the existing debt. The borrower going through consolidation must then only repay the new loan. A consolidation loan could even have a lower interest rate than some credit card debts and school loans. Debt consolidation will immediately stop revolving late fees and other charges that increase what is owed. Lenders and collection agencies will stop calling as well. Going through a professional consolidation service early can help to preserve credit. This is one of the best options available when dealing with large amounts of school debt from multiple lenders. Anyone dealing with school debt should attempt to communicate with lenders if problems seem imminent. It is a good idea to keep lenders updated at all times so that no important communications are missed. Some lenders might be willing to restructure payments each month to make them more affordable. Anyone dealing with loans might be able to get a forbearance or deferment if there is sufficient evidence that an emergency has occurred. It is important to note that most lenders will only provide a limited number of deferments or forbearances. This means that they should not be used while other options are still available. The two parts of a loan are the principal and the interest. The principal is the initial amount of the loan. Interest is calculated on the principal every month. It is very helpful to pay down the principal on a loan whenever possible. Lower amounts of principal will lower interest payments. This will significantly reduce the overall cost of the loan over several years. Paying down principal is done by sending an extra payment after making the required monthly loan payment. The extra payment is often applied directly to the principal. Not all lenders will allow this. Late payments can destroy a credit score and drive up the amount of debt owed in a very short time. Late payments are often accompanied by late fees that can be very large. Some banks and lenders will even increase interest rates when late payments occur. Several late payments in a row can make it impossible to repay debt due to the penalties and fees. It is better to plan for a solution like consolidation rather than to allow the debt to grow uncontrollably.